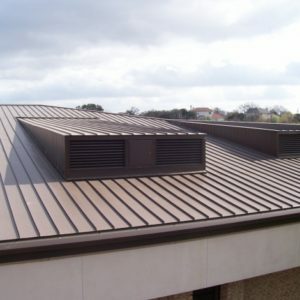 Armadillo Roofing provides Austin commercial roofing and industrial roofing services. We use state-of-the-art commercial roofing materials and top-grade engineering to meet our customers roofing system standards. As an example, we use reflective coating on commercial roofs as a cost effective means to enhance longevity and lessen internal temperature. Also, we provide additional Austin commercial roofing services, including commercial restorations, commercial maintenance, commercial roof installations, and pre-evaluation and prognosis reports. Flat roofing has become more common in contemporary society. Flat roofs are quite common in countries like Mexico, which have a relatively dry climate. However, they’re are becoming more popular for other reasons. For instance, some of our clients prefer flat roofs so that they can utilize them and gaze at the stars, or get a nice view of their neighborhood from above. Others prefer a flat roofing surface because they allow water to run off freely from a slight incline. Regardless of your reason, Armadillo Roofing will always accommodate your roofing preferences quickly and at a fair price. Commercial roofing contractors used gravel for flat roofing surface material in the past but has since stopped using gravel because it can be susceptible to ice dams. Ice dams can cause a flat roof to sag over time-defeating the purpose of a “flat” roof as an aesthetic choice. We currently use different roofing materials to engineer our flat roofs, including modified bitumen, polyvinyl chloride, thermoplastic polyolefin, and turbo seal. We have also shifted to perpetual membrane sheeting for our flat roofs. We’ve found that perpetual membranes are more resistant to accumulated static water during the rainy seasons. We also use top-grade adhesives to bond together multiple sheets in order to offset the penetration of wind and water with all of our commercial flat roofing structures. Commercial flat roofs are still more susceptible to wear and tear, especially if renovations (i.e., upgrading HVAC apparatuses) are implemented. Hence, we do not recommend the use of a flat roof as a usable area without an additional roofing support system set in place: such as topsoil, stones, or a wooden deck to protect the membrane of the flat roof. Fortunately, commercial flat roofs also have several distinct advantages. For instance, commercial flat roofing is the most cost-efficient commercial roofing solution because the entire roofing area can be used for recreational purposes. We would also recommend a flat roof if you plan on installing solar panels in the future due to logistical convenience. Armadillo Roofing provides shingle commercial roofing materials and assembly. Roofing shingles – when administered correctly-overlap one other as individual pieces. In fact, we employ a variety of roofing materials when applying commercial roofing shingles. We recommend the use of fiberglass asphalt shingles due to their lightweight build, fire resistance, and impressive durability and longevity. Thus, if you want shingles, the most cost effective commercial roofing material, we would recommend fiberglass asphalt shingles as your first choice. We provide several different shingle commercial roofing choices. Each shingle variety has its unique pros and cons and we will provide a free consultation to select the ideal shingle solution for your unique Austin commercial roofing needs. Armadillo Roofing is renowned for its tile roofing techniques in the Austin commercial roofing community. We recommend tile roofing because there are many architectural choices to choose from. Some of thestyles that we provide include colonial, avant-garde, contemporary and mediterranean. Our commercial roofers enjoy working with tiles due to the vast array of styles, as well as their diverse color palette. In addition to their stylish and multicolored variety, tiles also come in all shapes and sizes. Tiles can be designed to be flat, round, or protrude or retract to give a concave or convex effect. 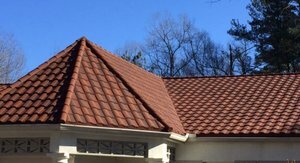 There’s diversity that only tile roofing can provide, as well as their durability, energy efficiency and low-maintenance for decades after installation. Tiles are also resistant against the elements of wind, hail, and snow. One of the reasons tiles are so appreciated is due to the proven track record of tiles in the Austin area. Tiles have proven their resistance against the elements in the Austin area for nearly a century. If you do decide to choose tiling as your commercial roofing choice, we strongly recommend the use of concrete or clay tiles for several reasons. For one, the impressive longevity that clay and concrete tiles provide. Studies conducted in the Austin commercial roofing community have revealed that clay and concrete tiles can last up to a century under optimal conditions. If those results weren’t impressive enough, tiles have been shown to be very cost-effective. Hence, there are several advantages to using tiles as your commercial roofing solution, including their remarkable durability, diversity, and cost-effectiveness. MBRF, due to its ease of maintenance, and superior flexibility compared to the tar based built-up roofing systems. It does not emit any fumes, has an average lifespan of 30 years, and is ideal for low or flat pitched commercial roofs. 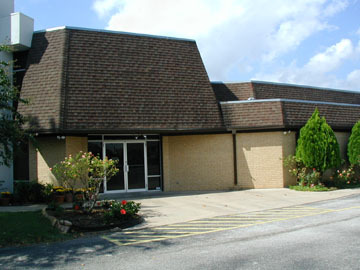 Armadillo Roofing is Austin’s commercial roofing leader of modified bitumen roofing systems (MBRs). Modified bitumen is an evolutionary offshoot of asphalt roofing. That is, while we use asphalting roofing materials in our MBR applications, we amalgamate them with a series of solvents and modifiers to optimize them. We embrace the flexibility and customizable features of MBRs. We use 5 different components that can be combined in several ways to form MBRs. For instance, we can use initial insulation to form a strong foundation or substrate for the commercial roof. We can then place a lower ply sheet under a bitumen based ply that is modified. 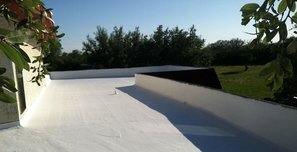 In addition, we can use a modified bitumen membrane that consists of either polyester or fiberglass matting for our Austin commercial roofing applications. Once these steps are complete, we hold together the layers/components using either a heated or unheated asphaltic adhesive. That is, we connect the segments using thermal catalysts to merge the asphalt in order to provide a protective seal. Or, we can use a subzero cooling process to apply the asphalt. Regardless of the application process, we would then protect the layers with a weathered surface finish to provide UV protection and topmost flashings to provide waterproof protection around the roof’s surroundings. The most common roofing bitumen variants that we currently use are roofing attactic polypropylene (APP) and styrene butadiene styrene (SBS). APP is less expensive but also has lower impact resistance, while SBS has superior impact resistance, it’s more costly. In addition, SBS modifiers give asphalt a “rubber-like” texture while APP modifiers cause roofing asphalt to exude a plasticized aesthetic. Hence, MBRs provide a wide range of combinations to create the ideal roof for your Austin commercial roofing or industrial roofing needs. MBRs provide several benefits- MBR components are resistant against fire, splitting, and thermal shock. We use a roofing bond that is foolproof and time-efficient. We believe that the various combinations at our disposal offer possibilities for optimal durability, style, and elemental resistance. Thus, MBR systems offer several benefits at a cost-effective rate. 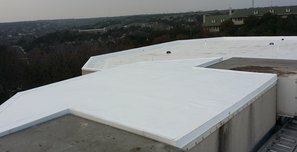 We currently use a white membrane roofing system as an EPDM variant. That is, we infuse it with titanium dioxide to reflect UV rays, thereby preventing damage to the polymer. We can apply TPO systems to any low sloped, flat, industrial, or commercial roofing application. We apply TPO roofing materials as a single-ply roofing fixture. Due to the high solar reflectivity that TPO systems provide, we believe they can generate a large amount of savings in the long term. In effect, the TPO system that we use involves proprietary elevated heat emitting technology that discharges large amounts of absorbed solar energy. The TPO white composites we use to implement our TPO commercial roofing systems can reflect up to 90% of the sun’s UV rays and release up to 80% of solar radiation thats absorbed by your commercial roof or industrial roof. This is in stark contrast to an asphalt based roof that can only reflect a maximum of 20% of solar radiation. Unfortunately, this leads to over 80% of the remaining heat being trapped within the buildings bearings. As a result, commercial roofing and industrial roofing property owners are forced to pay increased energy bills. 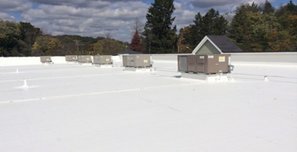 In addition to being cost-effective, TPO systems are durable and easy to install on any commercial roofing surface. We employ TPO systems due to their wind resistance and the fact they are virtually leak-proof and require minimal upkeep. They also possess inherent cooling abilities that lower heat and greenhouse emissions. We believe the high solar reflectivity that TPO systems provide can protect the roof’s membrane from thermal damage (i.e., chipping) thereby increasing the life span of your commercial or industrial roof. We strongly recommend the use of TPO systems due to their solar reflectivity, impressive thermal emissions, environmental friendliness, energy efficiency, and cost effectiveness. We highly recommend metal roofing due to its perfect balance between durability and style. Metal commercial roofing is also fire resistant, immune to most elemental forces, and extremely energy efficient. We’re specialists in commercial metal roofing systems. Generally speaking, we use tiles or pieces of metal to create our metal roofing systems, in addition to a form of galvanized steel – that is corrugated – to form our metal sheeting apparatuses. Commercial metal roofing systems have several distinct advantages over other commercial roofing materials and systems. Due to the light weight of metal materials our crews can easily assemble or dissemble metal roofing materials, making for impressive portability. In addition, our metal utility and agricultural metal panels tend to last approximately 25 years. Thus, we believe that metal roofing systems are portable, lightweight, and durable. The roofing industry has developed proprietary metal amalgams, consisting of copper and zinc hybrids to further enhance the durability and strength only commercial metal roofing systems can provide – while reducing costs substantially. We strongly recommend metal roofing systems if your commercial or industrial establishment is spacious – due to the impressive strength to weight ratio that they provide. In addition to all of the benefits we’ve mentioned, commercial metal roofing systems are also resistant to elemental forces such as hail, fire, wind, and snow. In fact, we would recommend commercial metal roofing systems as your first choice if your industrial or commercial complex is situated in a northern or mountainous region due to their snow shedding abilities. As for the environmentally conscious, we recommend metal roofing systems due to their biodegradability. We use copper and aluminum materials that are made of 90% recyclable material. Thus, our commercial metal roofing systems are highly flexible, energy efficient, and require minimal maintenance. However, metal roofs are not without their disadvantages. Due to the fact that metal expands via heat, you must take into account the disruptive noises that may develop over time. Metal roofing materials also tend to be more expensive than other materials. Overall, however, we believe that metal roofing systems’ pros outweigh their cons. For the ecologically conscious, we provide a green roof solution…literally. We can completely or partially cover your roof with vegetation and fauna. However, a water retardant membrane, drainage and irrigation system, and root barrier are installed underneath. Armadillo Roofing is a pioneer when it comes to environmentally sound Austin commercial roofing solutions. For our environmentally conscious Austin commercial roofing clients, we generally implement green roofing systems. To do so, we will superimpose a green roof over an existing roof because a green roofing system is essentially an extension of an existing roof. We will ensure that the green roof is both root repellent and waterproof. We will also install an ample drainage apparatus, in addition to filtration cloth, and a large variety of foliage to infuse your roof with an organic roofing aesthetic. We recommend green roofing systems for many reasons. For instance, green roofing systems provide substantial insulating qualities. Green roofs can also serve as natural habitats for wildlife. They have the remarkable ability to absorb rainwater to nourish its vegetation, as well as the ability to lower air temperature, thereby reducing the “heat island effect” that is common in industrial and commercial metropolitan areas. Furthermore, they have pollution reducing effects that lower CO2 emissions. Unfortunately, despite all of the benefits that green roofing systems provide many are unaware or hesitant to adopt them into their industrial or commercial establishments. This is more apparent here in North America than other areas around the world. 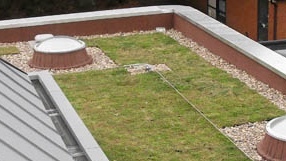 In many European countries, there has been a substantial growth in the adoption of commercial green roofing systems. This is due primarily to support from both legislative and municipal levels of government. Countries such as Germany and France have understood the benefits as well as the financial incentives that green roofing systems can generate, leading to millions of dollars of revenue being pumped into the financial sector. As you can see, Armadillo Roofing & Exteriors provides a diverse array of Austin industrial roofing systems and commercial roofing solutions. We also provide a comprehensive commercial roof maintenance program to ensure your new roof will be your last. If you’re interested in contacting a commercial metal roofing contractor, give us a call at 512-333-7663.